Bronwyn Bell joins Adam, Brian, Carmen, and Jeff to discuss the challenges and responsibilities of an environmental engineer working in the mining sector. Carmen likes to help out local beer brewers in harvesting hops, but he’s not sure what makes for a good hops growing season. Environmental engineers plan, design and manage projects associated with environmental protection or remediation. Our guest for this episode is Bronwyn Bell, an environmental engineer from Western Australia with extensive experience in the Mining & Resources economic sector. An unfortunate early experience with Super Glue, while building a popsicle stick bridge, convinced Brownyn that she’d rather not be a civil engineer. Subsectors within the environmental engineering field include wastewater treatment, air pollution control, waste disposal, recyling, and public health management. Bronwyn managed to make spending time at a nearby beer brewery an integral part of her engineering studies. Our guest has worked in coal mines, iron mines, and diamond mines… and has also visited a number of gold mines. Kimberlite is an igneous rock that may contain diamonds. Alluvial diamond mining is usually associated with smaller-scale mining operations. Browyn has done a lot of work in the Pilbara region of Australia, which contains some of the Earth’s oldest rock formations. Tailings are the materials that remain after ore is processed to remove its more valuable components. Brian jokes about differences in pronouncing the thirteenth element on the periodic table. A metric ton, or tonne, is a mass equivalent to 1,000 kilograms. Bronwyn notes that a good environmental solution is often a good financial solution, as waste reduction aids both. One of our guest’s projects received financial relief due to the presence of Asian green mussels. Our guest can be reached via email: billson.bell -=+ at +=- gmail dot com. 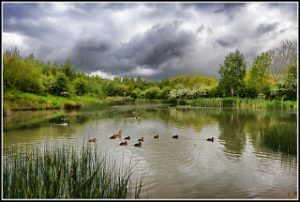 Thanks to Stephen Bowler for use of the photo titled “Ducklings.” Opening music by John Trimble, and concluding theme by Paul Stevenson. I really enjoyed listening to this podcast. Very informative. I am currently an Environmental Health Officer in Jamaica, who will be studying Environmental Engineering (post graduate level). This podcast has given great insight into what could be studied, what the field itself entails etc. Good work again and I look forward to more podcasts.